At its heart The China Syndrome is a pointed political commentary, but out of the procedural details emerges an expertly executed, razor sharp thriller. The hit film from James Bridges captures the tail end of the '70s paranoia genre - the story of a near-nuclear meltdown captured on tape by a news crew and the dramatic fight to uncover the big industry falsifications and spin control which ensued. Jane Fonda plays Kimberly Wells, a female TV news reporter who is successful at fluffy puff pieces looking for that big break into serious journalism. She finds it when she’s asked to do a routine story on the local nuclear power plant. Her breakthrough story seemingly falls in her lap when her tour of the facility is interrupted by a near-nuclear meltdown. Trapped inside the glassed-in observation deck, camera operator Richard Adams (Michael Douglas) covertly catches the entire event on camera. Adams films the tense moments as shift supervisor Jack Godell (Jack Lemmon)powerlessly watches the water level lower and almost expose the nuclear core. Wells and Adams think they’ve got an important news story on their hands until it gets kyboshed by the uncourageous media bosses. Fearing a lawsuit against the organization for filming illegally, it will take the stamina of Wells and Adams to fight the good fight and win. Adams, the bleeding heart, is full speed ahead, but Wells is skeptical of risking her job and possibly her neck for the cause. Together they have to convince the workmanlike Godell who holds all the cards needed to expose the company’s nefarious culpability. Bridges uses common sense intelligence and strict realism without cinematic embellishment to capture a mood of quiet suspense. The crucial accident scene is played without music and with little dialogue. Instead he uses carefully chosen shots, the ambient noise and the silence of the room to capture the tension. We never see the water level rising, the nuclear core shaking or any other literal visuals of the accident. Bridges puts us in the point of view of Godell, who only watches a dial slowly wind down to zero. And so it’s up to Jack Lemmon to sell us ungodly fear. Lemmon is a master thespian and his unspoken facial reactions are as full of life as any over-the-top chaotic action scene could have dramatized. Very topical in its day, the film was made at a time when nuclear power was becoming a popular substitute for coal and oil. The title refers to the analogy of what could happen if that nuclear core was exposed – a meltdown of such extreme proportions that it could literally melt through the earth emerging on the other side of the world – in China. The description of this possibility puts into perspective the type of fire with which humanity constantly plays. Eerily, 12 days after the release of this film the nuclear accident at Three Mile Island occurred – in the same geographical area as this fictional story. 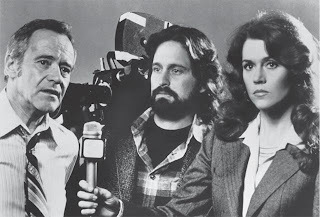 The China Syndrome is one of only 8 films James Bridges (The Paper Chase, Bright Lights Big City) ever made. His sparse but selective body of work shows a distinct integrity, truth and honesty. His faith in realism has consistently resulted in an ability to project all the cinematic emotions without traditional Hollywood embellishments. Sadly, Bridges died early at age 57 of cancer. The China Syndrome is a good movie, and you rightly point out how concern is conveyed not by special effects but by acting. Unfortunately, the realism of this this film results in it being taken as a near-truthful documentary of the nuclear industry by many who watch it. It's not. I guess that's a real tribute to the filmmaker (but not the audience). If you would like to understand how US nuclear plants really operate from someone who does it every day, see my free techno-thriller "Rad Decision". The plant involved and the climatic event bear some simularities to Fukushima. Free online, no advertisements or sponsors - just google the title or go to my homepage. Written for the lay person. Reader reviews are at the homepage or Amazon. I'm sorry it's not a film -- my budget ran out.